This tart is open topped with a crusty pastry and almond edge. It’s easy to assemble, making it ideal to get the kids involved with. For an even speedier assembly, use readymade shortcrust pastry, in which case the filling will fill two sheets of pastry and the tarts will be more oblong rather than round. First, make the pastry by blending the flour, butter and ginger (if using) together in a food processor until it resembles fine breadcrumbs. Add the sour cream and blitz to bring everything together as a dough. Bring together in a smooth ball, then flatten slightly. Wrap in cling film and pop in the freezer while you make the filling. To make the filling, mix the brown sugar and cornflour together in a large bowl. Trim the rhubarb and cut into 2.5cm lengths, then add to the bowl. Halve the cherries and discard their stones, then toss the fruit into the bowl. Roll the pastry out on a large piece of parchment paper to a 38cm circle. Pile the fruit mixture into the centre of the pastry and spread it out a little, leaving about a 7.5cm border. Sprinkle any leftover sugar and cornflour over, allowing it to fall through the fruit. Fold the pastry edge up over the sides of the filling to create a rustic tart with the fruit still exposed in the centre. Lightly brush the pastry edge with the beaten egg and press the almonds on to stick. Slide the whole thing onto a large baking sheet by carefully pulling the paper onto it. Bake in the oven for 35 to 40 minutes, until the pastry is golden and the fruit is tender and juicy. To serve, dust the tart with icing sugar if liked. Cut into wedges and serve with softly whipped cream, crème fraîche or ice cream. 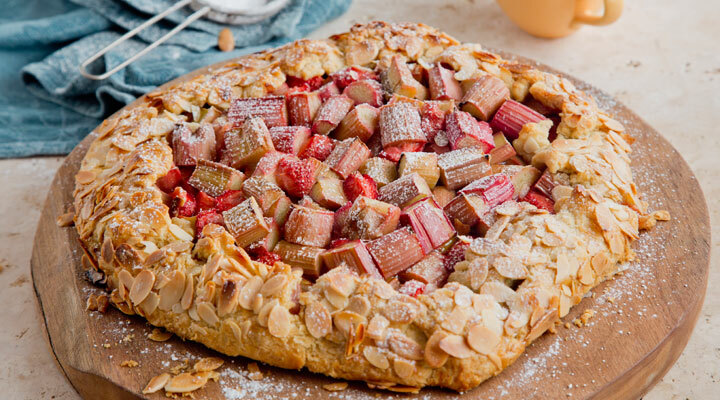 TIP - This is equally delicious made with different fruit combinations like rhubarb and strawberry, peach and apricot, or apple and blackcurrant. Use ground cinnamon or freshly grated orange zest instead of the ginger if preferred.